Life can be funny. If you have a child, or you’re about to become a parent for the first time, you are going to get loads of people coming to you with advice. Whether it’s your own parents giving you a lesson on how they brought you up, or your child-rearing mates with their own titbits of advice, you are going to get inundated with guidance. So much in fact, that eventually you are going to turn yourself off to what other people are saying, and go your own way regardless. After all, your child, your rules! How dare other people tell you what to do. The trouble is, of course, there are some pieces of advice worth listening to. No matter your situation, here are the pieces of advice we think are worth heeding. Be sure to pass them onto other mums, and if they don’t listen, well, at least you tried. As a new mum, not being able to sleep is a given. Being awoken at 3 am by your child screaming the house down is going to disrupt your beauty sleep. Still, there are ways to reduce the problem. These are the perfect cots and cot beds we think you should consider, as a comfortable child is going to sleep a little better, and remember that your partner needs to take his turn looking after your little one in the early morning hours. However, you do need to face reality, so settle in with your child’s sleeping pattern. If they sleep during the day, get a power nap at the same time. Your body will need it, and you will feel better as a result. There are always going to be those mums who appear to know everything there is know about raising a child. Their child never has temper tantrums. Their house is always immaculately clean. They have everything under control, and nothing will ever phase them. As if! Nobody is perfect, and no matter what image they convey to you, they are not perfect! So, don’t worry if you are late on the school run. Fear not if your child kicks off in the supermarket. Who cares if your house is a mess on a regular basis! Parenting can be tough, so relax, realise you are only human and give yourself a break! As a mum, your first instinct is to take care of your child. That’s normal, and if that weren’t the case, we’d be worried. Still, you do need to take care of yourself. Unless you want to burn yourself out, you need to take time out and still be ‘you,’ making time to do the things you enjoy. Therefore, become best friends with your potential childminders, and give yourself a night off now and then. Get your partner to take responsibility for your child while you enjoy a night with your mates. Record your favourite tv shows and watch them when you finally have a minute. In short, live your life! Your family won’t fall apart if you have some ‘me time’ occasionally, so take care of your needs as well as your child’s. Do you have extra pieces of advice you think other mums should know? Let us know, and share your wisdom with others. It’s that time of year when parents of 3 and 4-year olds across the land are starting to get a little bit anxious. I’m not talking about Christmas. However, if you want some tips on how to make some extra cash for the big day this will help. Instead, I’m talking about applications for primary school places. With the closing dates for applications looming in January, adverts for open days have been popping up nearby. It made me realise I was debating the question of which school to choose a whole year ago. So while you prep manically for Christmas, the important decision of which primary school to apply for will also be on the back of your mind. I made endless visits to different schools but didn’t have a clue what I was meant to be looking at or asking. Luckily for me, I didn’t have too much choice and my catchment school seemed to be very good. Of course, that didn’t stop me worrying. Should I put Lily in the pre-school? What if we didn’t get in? Would she be overwhelmed by the size of the class? Was the smaller school up the road a better choice? Would Lily make friends? We’re now three-quarters of the way through our first ever Autumn term. In many ways, I’m still getting used to school etiquette. 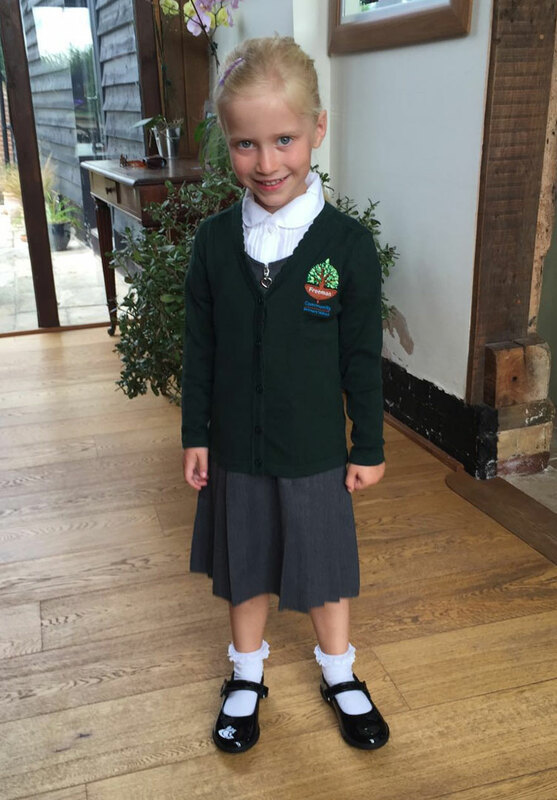 But here’s my reflections on the build up to her starting school and what I’ve learned about the school run. Your child’s happiness is the most important thing as they settle into school. Don’t be distracted by the headlines of grades and Ofsted reports. Instead, be guided by whether it’s the right type of environment for your child. Try and gauge how friendly the teachers and staff are. Ring the school with any questions you have. Their response can be insightful. I was put off one school simply by a snooty receptionist. Open days are designed to show the school in a good light. If you have doubts about the school, ask if it is possible to visit or have a tour at a different time. There’s more chance to see the school in action as it normally is. Speak to people who have children at the same school. What do they like about it and what annoys them? Don’t panic if you don’t get the school you want. I’m not speaking from experience but I know from talking to other mums that appeals are unlikely to be successful. So look again at the other options in your area. Bear in mind that places do still become available after the formal offer date and through the school year. So fight to get yourself to the top of the waiting list should a place become available. Try not to make such a big deal about starting school. This is tough since it’s the most momentous occasion for you and them since they were born. But for most of last year, it’s all anyone spoke to Lily about. We pointed out the school whenever we drove past; school was the favourite topic of conversation with grandmas and grandads; she learned a new song at nursery all about going to school; she visited the school lots; and the teachers visited us at home too. I also constantly reminded her that big girls who went to school behaved or did things differently. No wonder she was nervous queuing up that first day! Don’t worry about your child if they don’t know anyone. This was a constant worry for me, since Lily had gone to a nursery which wasn’t in the local area. A lot of the children will be in a similar situation. If you keep talking to your child about making new friends this will become an issue when it needn’t be. At the age of 4 & 5, children flit between friends very casually. They also love meeting new children, meaning Lily was welcomed with open arms into the different friendship groups which already existed. They will also fall out with people too, something I’ve not had to deal with before. As a mum of a girl, it’s tough watching this happen or trying to explain why. But, if you’ve ever watched The Secret Life of 4 Year Olds you’ll realise it’s completely normal and something they need to go through. And lo and behold, they’ll all be friends again the following day! If getting out of the house is already an exercise in military planning, be prepared to take it up a notch! Gone are the days when there’s flexibility if you are ever running late. Instead, you absolutely need to have your child in that queue at the start of the day and be there waving at them when they finish. There may be a stern look from the school receptionist when you sign your child in late in the morning. Asked why their son was once late, my friend tried to garner some sympathy blaming it on a mix up with her husband. No sympathetic smiles were forthcoming though! I’m not perfect and have been a little late collecting Lily on a couple of occasions. The teachers understand. However, it is heartbreaking seeing them standing to the side desperately searching for you across the playground. Watch the weather reports. If there’s likely to be frost and you have to drive then the alarm unfortunately needs setting just a little bit earlier. And be prepared with an array of outfits suitable for all weathers. It’s no fun turning up at school looking like a drowned rat! The school run is tiring and relentless. You’ll be looking forward to a break from it come half term as much as them! It’s a bloody nightmare! If there’s any way you can avoid taking your car, do it! If, like me, you have no choice, then be prepared with snacks for little ones stuck in the car with you while you wait or queue. And sit back and enjoy the occasional spats you’ll see break out! You’re unlikely to get any kind of response to the question what did you do at school today? Instead, be prepared for snippets of information to be forthcoming at random times like when they’re on the loo or you’re in the middle of getting dinner cooked. The school playground is a scary place. Don’t panic if you find you inadvertently lead your children into the middle of a raucous game of British bulldog. Remain calm, look for the nearest imaginary boundary and try and move out of the way as swiftly as possible. It can feel like you’re back at school again as you stand in the playground not knowing anyone. The faces will soon start to become familiar! You’ll lose track of all the different events: school assemblies; class visits; non-uniform days; fairs; charity days; and school photograph day to name but a few. Thankfully, the school does email you about all this. But make sure you check your junk email; most recently this saved us from the embarrassment of turning up to school in uniform on a non-uniform day after stumbling across the email the night before! You will have lots of homework to complete! Yes, you! Every week there’s sounds to be identified and practised, maths games to be played and books to be read. Clearly this is all aimed at helping my daughter learn but, as she’s still only 4, it does require quite a lot of effort from parents too! And don’t get me started on the school squirrel. We’ve been blown away by just how much Lily has thrived at school. She loves it! They will astonish you with the different things they pick up and how everything they are learning suddenly starts to sink in. They suddenly seem very grown up which does make you pine for their younger selves somewhat. But it’s also very exciting starting this next stage of their lives. On the face of it, an innocuous cuddly toy. But, sent to stay with us last week, he quickly became my nemesis! I’d been dreading this since I found out about Sammy when Lily started school in September. Every week, I’ve had to console a disappointed Lily as she pointed out who he’d been sent home with whilst secretly overjoyed that I’d escaped for another week. Now don’t get me wrong, I understand the benefit in packing the squirrel off to a different home each week. Lily was elated when she came out of school with Sammy and so excited to involve him in everything at home. Certainly I didn’t want to deprive her of this. In my defence, this probably explains why I threw myself into the task in hand. But when I opened the accompanying diary of his adventures I was filled with dread. The instructions that the diary was merely a prompt for the teachers had clearly been ignored. Instead, there were pages and pages of photographs of Sammy at various clubs, making cakes, off out for walks and at local attractions. Daily diaries recounted his every move. And in some instances the 4 and 5-year-olds had even done the write ups themselves. Bugger! 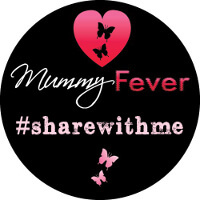 I had a baby recovering from hand, foot and mouth and a stinking cold. My plan was to have a quiet week. Sitting Sammy in front of the TV at any point clearly wasn’t going to cut the mustard. There wasn’t going to be much chance of matched betting any evening this week either. Luckily, it was Halloween that first night. Mr Matched Betting Mum was coming back from work early to take Lily trick or treating, so Sammy could go with them. Clearly swept up in the excitement and commotion of Sammy’s arrival I don’t know what came over me as I heard myself say to Lily, “it’s a shame Sammy doesn’t have a costume“. What was I thinking? 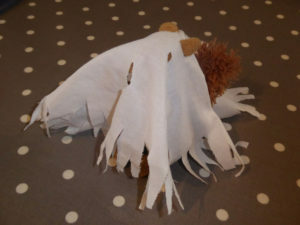 The next thing I knew I’d rummaged around in the shed for some old cloth and was making this toy squirrel a made to measure ghost outfit, complete with holes for his ears and tail! In an instant, I’d become the mum I’d feared seeing as I flicked through that diary. I hated myself for it but I couldn’t help myself as I desperately snipped away refining the costume whilst simultaneously feeding Olly his dinner. The next night Lily had swimming lessons. Easy, I thought. We’d just take Sammy with us and get a quick snap of him by the pool. By this point, however, it was clear that Lily was using Sammy as the perfect excuse to be a little bit naughty. 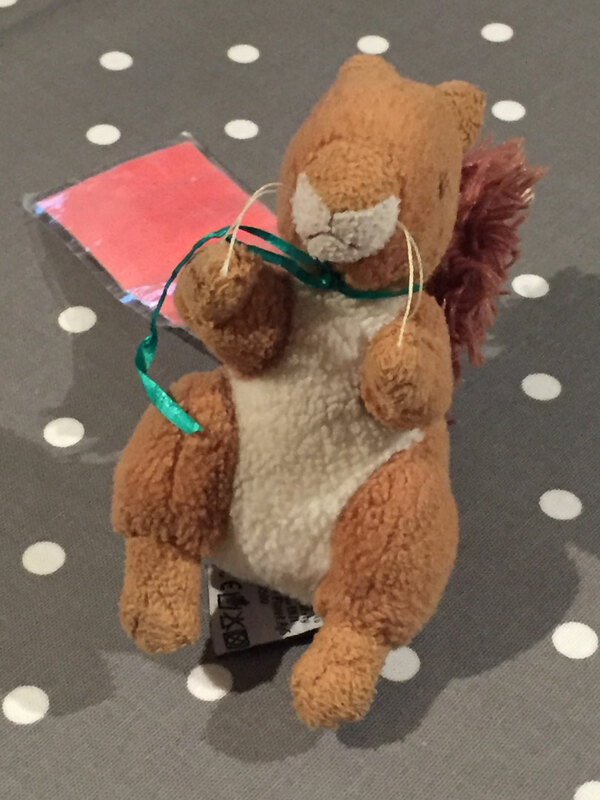 Apparently Sammy was a bit of a cheeky squirrel and liked to be mischievous, throwing toys and food around. Quite cunning of my daughter really. But super annoying for me! So as we all traipsed to the pool there was talk of Sammy wanting to go swimming too. By way of context I should explain that taking Lily swimming is a pain at the best of times because her brother Olly has to come too. Olly is a 15-month-old bum shuffler who doesn’t stand up. The not standing thing is a real arse when we go swimming. The changing rooms floors are covered in water and, from the smell of them on occasions, child’s pee! So it’s always a difficult manouevring act as I juggle helping Lily change while ensuring Olly doesn’t shuffle off the towel I’ve strategically placed on the floor or stick his feet or head out under the door since it’s a bit of a trampling risk! So it’s fair to say I was a bit dishevelled as we headed to the pool area! And now, from the glint in my daughter’s eye, I could see that Sammy was headed for the baby pool. Luckily for me, I managed to intervene in time, wrestling the squirrel from her whilst explaining it was dangerous as Sammy couldn’t swim. Clearly, Lily couldn’t quite be trusted with Sammy and so from that moment it was another thing I was laden with, in addition to our coats, scarves, boots and the baby! The next night, I didn’t have any plans. That’s very normal for us, but a quick glance through the diary confirmed Sammy did something different most nights of the week, so I needed some sort of plan. Luckily, Nana came to the rescue. She was off work that day so we could go there and I could hand responsibility for an exciting diary entry over to her! She rose to the challenge. I think she was secretly overjoyed about having a little role in Sammy’s adventures; neither my brother, sister nor I brought any school toys home with us! So a quick walk to the local river to play pooh sticks with Sammy was perfect. On the last night I had to go to the school for my first ever parent’s evening, so Daddy was back early from work to take charge! Could he think of something interesting to amuse Sammy with? The grunts and confused expressions confirmed not. Cue some quick thinking from me. The weekend before we’d made some chocolate playdoh in a last ditched attempt to keep Lily entertained as half term drew to a close. So I left Sammy dutifully watching Lily making letter and number shapes. A perfect educational activity to end the week on! Of course, my week wasn’t quite over at this point because I now needed to write a report about his adventures! So after the kids were in bed when all I wanted to do was curl up on the sofa and indulge my cold, I found myself swearing at the printer as I tried to print off all our photos, desperately searching for the pritt stick and cobbling together some descriptions about what we’d been up to. Lily was over the moon the following morning when we looked through our diary entry. She couldn’t contain her glee about telling everyone what he’d been up to back at school. And I suppose that is the reason I made the effort I did in spite of my reluctance! But I was glad to see Sammy go back to school with Lily that morning. To all the other parents yet to have Sammy to stay, I can only apologise that I became the parent everyone dreads to see in that diary! I love to cook. I hate that I don’t have much time for it. Between looking after the children, matched betting, writing blog posts and fitting in exercise in the evenings, more often than not dinner takes a back seat. I’m therefore a huge fan of tasty healthy dinners that can be done in next to no time. I’ll occasionally share my staple recipes with you here, with my tips on ensuring your meals are as cost effective as possible. As a child of the 80s I’m not very good with fish. My only encounters were with the frozen kind coated in batter or breadcrumbs. I’m getting better and I have now grown to love shell fish in particular. This meal serves 4 and takes as long as it takes to boil the pasta, about 10-12 minutes in total. That will leave you lots of time to get logged into Profit Accumulator and get your bets placed afterwards! Cook the pasta in lightly salted water for 10-12 minutes. In the meantime, heat the oil and butter in a large frying pan and stir fry the spring onions, garlic and chillies for 2-3 minutes. Add the prawns and cook briskly for 3-4 minutes until cooked through. Stir in the lemon juice and coriander, then remove from the heat. Drain the pasta and pour into the prawn mixture. Mix together, season and you’re done. Buy frozen raw prawns. All the major supermarkets sell them in their frozen sections. Every few weeks my local Tesco offers 25% off as well (other supermarkets do the same too), so I will stock up with a few packets at a time just to pop into the freezer. Freeze your chillies. If you need to buy a packet of chillies, pop those you don’t use into the freezer. There’s no need to defrost them before using frozen chillies in cooking. Simply take them out, cut them up, deseed them and add them straight to the pan. I dread the question “what do you do?” although I never used to. I had a very successful career before the birth of my eldest child Lily back in 2012. I was proud to be one of only a small number of people who made it through the graduate entry exams for a fast tracked civil service career. I worked hard and had my future mapped out. I enjoyed playing a small part in how the country works and I liked telling people about it. I miss it and maybe one day I’ll return to do something similar. But I also remember that I wasn’t entirely happy either. The politics – both the real stuff and the office stuff – frustrated me. I also spent a lot of my 10 years in Whitehall dreaming of working for myself. So when redundancies were looming at the same time I was pregnant with Lily I jumped at the chance to escape and start a new adventure. Of course, I didn’t factor in the added complexity of just how much my life would be thrown upside down by the arrival of my little girl. With my hubby working away most of the week spare time was non-existent. Nevertheless, I did eventually get a small business selling upcycled furniture and vintage items up and running. And we were doing well. I was proud of starting up a business that gave us some extra cash and could also work around having a child. And I’d happily tell anyone who’d listen all about it! But the birth of my second child, Olly, forced me to have a break. And time away from the business really made me think about how viable it was. When I thought about just how much of my time it took up, I sadly realised it wasn’t worth starting back up again. I was constantly on the road looking for new stock, painting and photographing items through the day and up late most nights doing all the marketing. And I wasn’t really able to be as creative as I wanted – the items that sold the quickest and easiest were rather plain and so the job had become rather mundane. I still have a passion for all things old and vintage and you’ll maybe see it emerge on this blog from time to time. But it was time for a new start. Though what exactly was I going to do? Going back to my former career was an option but it would have turned our lives upside down and that’s not something I’m prepared to do just yet. I really want to give Olly the same amount of time and attention Lily’s had from me whilst he’s young. I’m also not one for resting on my laurels. I’d been interested in starting a blog for some time but wasn’t sure anyone would want to read about my day to day routine. I knew I wouldn’t actually be that interested! However, when I discovered matched betting I realised there might be an option for me to marry the two. And so Matched Betting Mum was born. But this leaves me in a bit of a quandry when I get the inevitable what do you do question. Just telling my closest friends was difficult enough. Cue blanked expressions and them being convinced I’d become a secret pro gambler. Gambling seems inherently seedy and dodgy. And telling people they can easily earn at least £500 a month from home sounds like I’m selling a scam! So, what do I say? Do I just keep quiet or do I mention the betting? 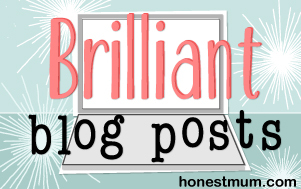 Writing this post has made me focus on what I’m really trying to achieve in writing this blog. And it’s actually made me realise there’s a lot to be proud of. Using my own initiative, the extra money I now make every month from matched betting means I can reliably contribute to the household income. Our main aim at the moment is to clear some debt that’s been hanging around us for a while. And then, maybe a few treats for the kids and paying for next year’s holidays. To help others work their way through what seems to be a quite complicated and befuddled process at the start (it gets easy I promise!) is actually quite a laudable thing in its own right too. I feel a great deal of responsibility if people start matched betting as a result of what I’ve written, hence all of the posts from me about how to make a success of it and avoid mistakes. And that extra money can help people in all walks of life – whether you’re in debt, unemployed, retired or are simply saving for a special occasion or want some extra cash! It’s quite an achievement to be able to help people do that. So the next time someone asks me what I do, I’ll say it loud and I’ll say it proud – I’m a matched better and I write a blog telling people how they can make money doing it too!